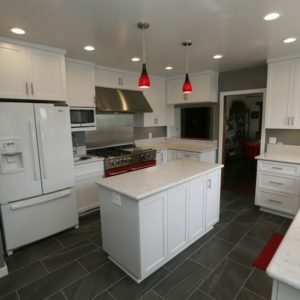 Depending on the scope of your project,Kitchen remodeling in Westminster CA has the potential to involve many challenging tasks, from installing perfectly level countertops and cabinets to rerouting plumbing and gas lines. Naturally, you need an experienced contractor like Cabinet Magic to make your project a success. As a licensed contractor, we can take you through every phase of the project with ease, from the initial design planning to sourcing the best designer materials–including custom cabinetry–to installing and finishing everything to a high standard. Kitchen remodeling in Westminster CA sometimes requires a leap of faith as you go from your sample selections to the real thing. For example, you may worry that your flooring and countertop won’t complement one another like you’d hoped, or that the color you’ve chosen for your cabinets will be too dark once a whole wall of cabinetry is installed. At Cabinet Magic, we never want our clients to feel worried that they’ll be anything less than thrilled with their kitchen remodeling in Westminster CA. That’s why we offer 3D computer rendering services on every remodeling project. We’re happy to create multiple versions of the design so you can easily compare different options. We never begin work without your sign off and approval of every detail of the design. Custom cabinets give you the ability to control not only the appearance your cabinets, but also their functionality. At Cabinet Magic, we have almost 30 years of experience in crafting custom cabinetry. We can custom fabricate any size cabinets with any combination of doors, drawers, roll outs, racks, and other storage accessories, and of course you will have your choice of styles and finishes. We take pride in our exceptional craftsmanship and we are confident our cabinets will last for decades. Are you ready to stop dreaming of kitchen remodeling in Westminster CA and start actually making it happen? Call Cabinet Magic at 800-828-4380 now and request your free in home consultation. We’ll go over your wish list with you and provide an estimate for the necessary remodeling work.